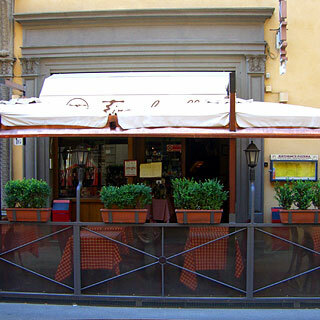 Florence has a rather low cafe-factor, in the sense that coffee culture is more about a quick espresso while standing up in a 'snack bar' than hanging around for hours in some lounge, or relaxing on a terrace in a leafy square. 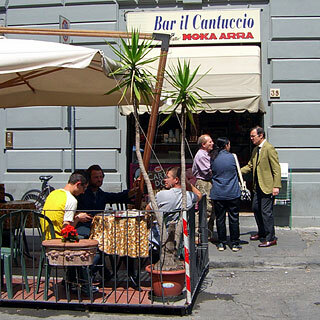 Instead, the few terraces tend to be rather sad efforts perched on the pavement in narrow traffic-heavy streets, outside bad restaurants that serve tourists who want to eat outside and do not otherwise recognise poor and overpriced pizza and pasta. Sitting inside, meanwhile, has little to tempt the idle cafe lover, since comfortable furniture is nowhere to be found. 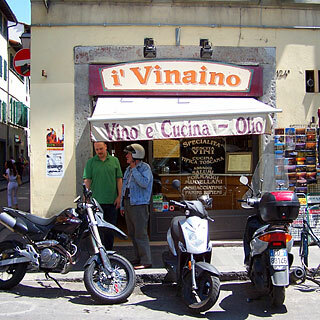 All we could do was hope for a decent bite to eat, a glass of drinkable Chianti classico, and a reasonable spot for a morning espresso and croissant. See also: cafe locations map. Having wandered around town for long enough to get hungry, we chose this pavement terrace more or less at random, since there was nothing obviously wrong with it and perhaps a little less noisy traffic than on most streets. 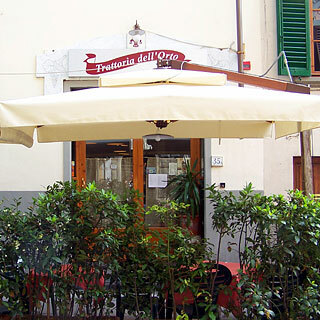 This is one of many tourist-oriented small restaurants on a narrow street that has a single row of half a dozen tables or fewer along the pavement edge on a deck-like terrace. Service was friendly and efficient, and we soon had half a bottle of cheap but drinkable house wine to relax with. We ordered simple risotto dishes from the primi piatti menu that turned out to be tasty and filling, although nothing special. I did like my risotto fiorentina (€6.80) though, even if this turns out not to be the best value around. That kind of sums up these places - nothing really to complain about, but not particularly pleasant, good or cheap. 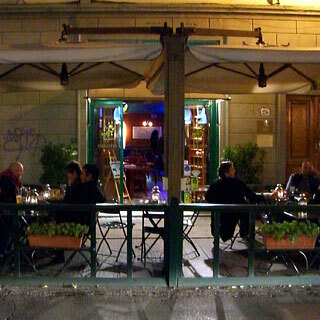 The key is probably Northern Europeans' desire to eat outside, and that the locals are sitting inside somewhere like Caffè Vitali. We dropped into this little wine bar and eatery for a glass of wine before dinner, and found a nice atmosphere for a drink at the bar. There was no real sign of bar snacks or 'tapas', but it was no problem to get a delicious plate of pecorino cheese and sun-dried tomatoes with bread, to go with our bottled beer and glass of Chianti. 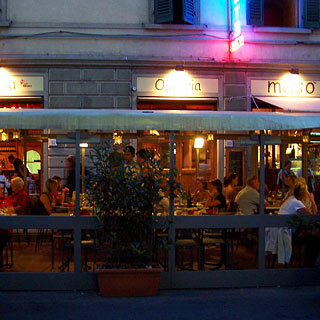 Masò is a fairly attractive trattoria-with-terrace that was handy when we wanted an evening pizza. It was a chilly evening, so we sat inside which has a pleasant enough ambience, but also fierce air conditioning, so we were cold anyway. Still, it all seemed pleasant enough, so we stayed. After we had ordered and got our wine we realised our mistake: restaurants full of tourists, such as this one, are one thing, but it was a shock to discover that is is possible to order such appallingly undrinkable house wine, which at €10 a bottle does not count as cheap in Florence - €4 for a half-litre carafe is average. In fact, the wine was so bad that we left half on the table, which I cannot remember doing for a long time. Unfortunately, the mediocre pizzas failed to make up for the disastrous wine. My calzone with sausage and soft cheese could plausibly be an authentic recipe, but I doubt that the sausage is supposed to be as bland as the utterly flavourless cheese. The vegetarian pizza was little better, as it only tasted of salt and dried herbs and lacked any sign of fresh ingredients. Avoid Masò, because food and wine this bad would ruin your idea of Tuscan cuisine; go to a supermarket instead. Still just across the road from i' Vinanio and Masò, we chose this terrace for breakfast. The coffee and croissants were good, which was just as well, because it was only the urgent need for food and caffeine that made us go for the plastic chairs. Unlike many dingy terraces on narrow streets, this street corner has a bit of space and more to watch, even if it is just mostly traffic. Unfortunately, though, I cannot recommend this place because we were overcharged for our coffees, which is sloppy at best. This quiet back-street cafe has a small pretty terrace on Piazza di San Pancrazio that is the first decent place we found to sit outside: this terrace makes sense, unlike the ugly tacked-on pavement-extensions that afflict so many other places, because there is room and because the tiny piazza has a good atmosphere. Best of all, the five tables avoid the horrors of plastic chairs. Fancy clothes and architecture notwithstanding, it is ridiculous to attribute style and good taste to a city whose restaurants tolerate cheap and ugly garden furniture on the pavement. 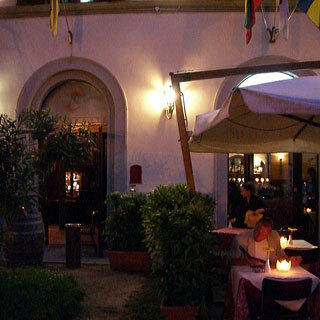 San Pancrazio, on the other hand, has decent furniture and is a good place to relax. Recommended. 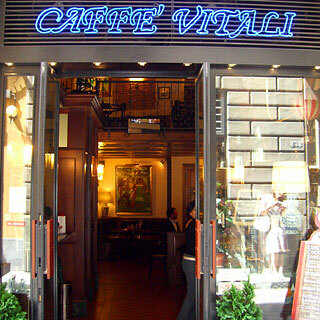 Having decided to avoid restaurants with tables outside, we chose Caffè Vitali for its stylish interior and good lunch menu. Indeed, after a couple of days wandering around in the sun, the cool tiled interior was a refreshing change and much more comfortable than a little table next to the traffic. We ordered a salad and a simple spaghetti dish (€5), which were great, with an excellent value of drinkable red wine (0.5 litres/€4) to go with them. 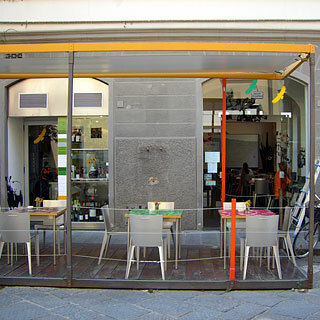 All in all, this is a much better trattoria for a simple good-value lunch, avoiding the tourist-only pavement terraces. It is also more interesting when the other customers are Italian. 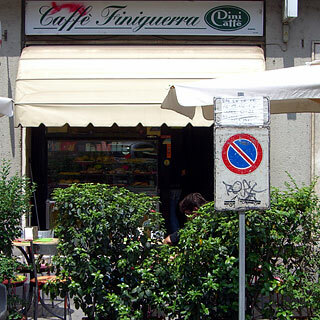 Caffè Finiguerra is one of the many small cafe bars that make a good morning coffee and croissant stop. This one is better than most, though, because it has more stylish and comfortable furniture, and a little more atmosphere. Despite the heavy traffic, Triangulo delle Bermude has a pretty good terrace, tucked onto a tiny side street that was a welcome place to sit down for a coffee. Inside, this is a proper ice-cream place, with excellent ice-cream. My tub of chocolate was delicious, and tasted like chocolate mousse. 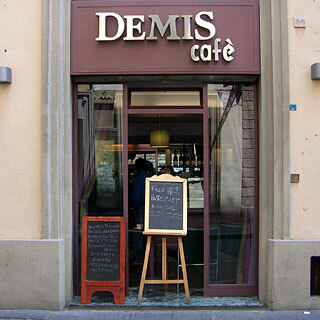 Demis is a rather strange cafe, with an over-the-top mauve and brass interior, with dark green chairs, like some seventies James Bond set. We popped in to use the free wi-fi, which we did not see anywhere else in Florence. We would have stayed a while, enjoying the comfy chairs, but by the time I'd read my mail we still hadn't been served, so we just left. While exploring the South side of the river, across ponte Vespucci, we found this excellent whose small facade hides a huge interior with several rooms. I thought we might not get a table, given the waiter's response to our arrival, but we were shown to a table in the corner of a big room, like the tourists without a reservation that we were. However, once the waiter had apologised for only having an Italian menu and being very helpful with translations, I got the idea that he was more amused than annoyed by us, being the only foreigners by the time the restaurant was full. The food was excellent, as were the large glasses of house wine (€4.50 a glass) which we chose in preference to a whole bottle, having had plenty to drink before dinner. The food was excellent: the traditional menu had some very interesting dishes, and our first courses, with fresh home-made pasta tasted fantastic. To follow I had wild-boar with spinach - also very good. The decor is interesting - plain grey walls with big bright modern paintings in mone room, and a more traditional feel next door. There are also several big tables, for groups, and a spacious feel overall, which is a noticable change to the more cramped norm. This is a more expensive restaurant than the others we tried - two of us spent €58 on two courses, a side dish and a glass of wine each, plus sparkling water and a coffee or dessert wine. By 'home' standards (the Netherlands or the UK) this was a bargain, and well recommended. Vip's Bar is a classic tourist-trap cafe: terrace only, 50 per cent above-average prices, aging chairs and tables, an unappealing menu and a fantastic view that makes it all worth it. Indeed, this spot on the hillside South of the river gives you an excellent overview of central Florence, plus the opportunity to take your own postcard photos. 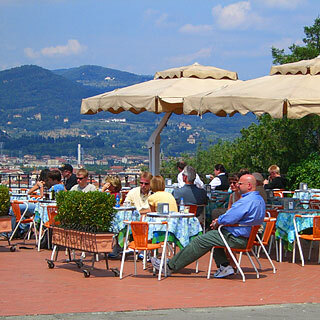 The cafe should not be necessary, but like the rest of Florence there are no decent benches. Still, you could always take in the views from the promenade around the car park, and then head down the San Salvatore steps to the rose garden, and chill-out there. 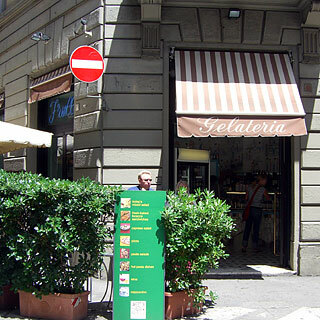 Ojo, or maybe 'Oio' given that they write the name with an inverted 'i', is a refreshing change among Florentine cafes. It is a proper cafe, designed as a pleasant place to sit around, and has a beautiful modern interior design, and a pleasant terrace with plenty of space. There is a slight Japanese theme, presumably this place is Japanese-run, that manifests itself on the menu with 'Italian sushi'. Unfortunately, we were too late for lunch so we could not try it. Otherwise, the menu features snacks, sandwiches, salads and cocktails. 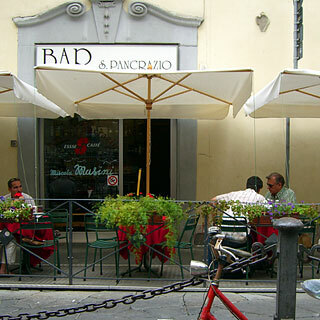 This cafe is the perfect cool antidote to the sweaty tourist drag of central Florence. This large atmospheric pub-restaurant seems to be a popular choice: three groups of twenty-odd twenty-something Italians were there when we popped in for a pint of German wheat beer and a large gin and tonic. The style is trendy with heavy rock bar and goth pub influences - lots of black and red. 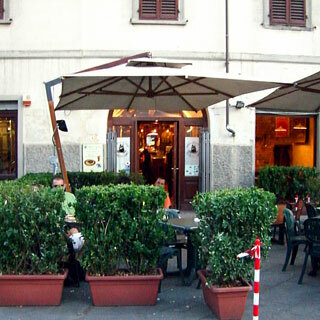 There is not so much a terrace outside as a couple of small tables for diners and a large crowd of drinkers. Lo Stregatto is a small bar that seems to be a very Italian take on an Anglo-Irish pub. The atmosphere inside is delightfully sleazy, but there were not any free bar stools so we settled for a table on the terrace, which was suitably mellow and comfortable. Like La Rotunda across the road, Lo Stregatto features foreign beers on draught, so I had another pint of German wheat beer, and enjoyed the atmosphere. Recommended. If you need a change from all that Chianti, or if you are a serious beer drinker, then this microbrewery is a welcome discovery. The three beers are excellent, especially the double-malt Axel, and you get a choice of sizes ranging from a 30cl piccolo (€3.50) to a two-litre jug (€15.50). As with the other places in this part of town, there are relatively few tourists - the lost and the curious - and this is only good for the atmosphere and value for money. In any case, the staff are friendly and helpful. On our second visit we all had pizzas, which were excellent: we all especially liked the substantial crusty base that was a great improvement on previous soggy experiences. My pancetta pizza, in particular, was very tasty. The decor is suitably basic, with plenty of bare brick and wooden benches and tables, with a few lame attempts to hang rustic implements on the wall. The hanging tapestries are pretty cool, though, and the overall atmosphere is good - a kind of Mediterranean pub.